July 10th, 2017 by Jeff Farrah & filed under Immigration, NVCA Blog. Stop me if you’ve heard this one before: an entrepreneur comes to the United States from her home country with dreams of growing an idea into a blockbuster company. The entrepreneur starts the company here because of our culture of innovation and risk-taking, coupled with robust financing options and the world’s best universities. 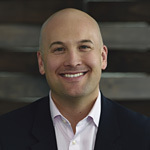 Working shoulder-to-shoulder with a venture capitalist, the entrepreneur succeeds and creates an exceptional company that employs thousands of Americans, improves lives, and delivers technological or medical advancement. Given the many benefits new companies bring the U.S., you would think our government would be clamoring to attract the world’s best entrepreneurs like policymakers have in Canada, France, and the U.K. Sadly, that’s not the case. Earlier today the Trump Administration announced it would do the exact opposite and delay International Entrepreneur Rule with an eye toward rescinding the rule in the next several months. That’s a missed opportunity and one that competitor countries are cheering today. What is the International Entrepreneur Rule? The rule operates like a ‘startup visa’ in that it would allow talented foreign-born entrepreneurs to form a startup in the U.S. that has substantial potential for rapid growth and job creation. The entrepreneur could remain in the U.S. for 2 ½ years to grow the startup, with a possible extension of another 2 ½ years. The entrepreneur must pass several hurdles to qualify, including demonstrating significant capital investment (e.g. > $250,000) from established investors with a history of successful startup investments. The rule is necessary to attract top entrepreneurial talent given the fact our country does not have a dedicated startup visa. Over the past few months, NVCA has been leading the charge to keep this common sense policy. 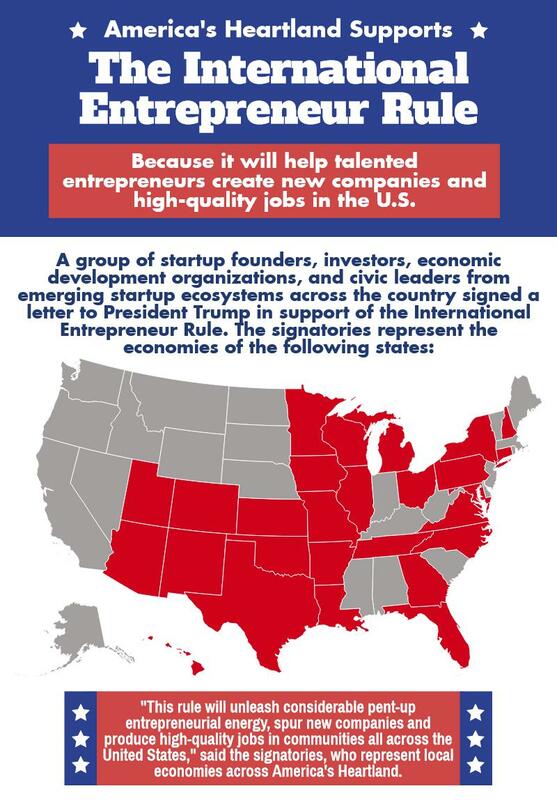 We have met with senior administration officials, collaborated with our Capitol Hill allies, shared testimonials of immigrant founders, and educated decision-makers on why the International Entrepreneur Rule will deliver jobs where they are critically needed. Rescinding the International Entrepreneur Rule is also at odds with President Trump’s goal of winning the global competition for jobs. The rule is desperately needed to retain U.S. entrepreneurial leadership. Sadly, the trend lines have been going the wrong direction: in the last five years, at least half of the top ten largest venture investments in the world occurred outside the U.S. Our share of global venture investment dropped to 54% in 2016, when it was only 81% ten years earlier and 90% twenty years before that. This means a top-notch startup founder can likely get venture backing in his home country and does not have the same need to come to the U.S. as he once did. We should be making it easier for founders to come here, not harder. Finally, rescinding the rule is at odds with the administration’s goal of advancing emerging technology. Last month, top VCs joined President Trump at the White House to discuss how to bring to life next-generation technology. What was one of the key recommendations from venture leaders? Retain the International Entrepreneur Rule so the best technology is created and developed here rather than overseas. Today’s action is 180 degrees from the recommendation of successful startup leaders. The administration’s move is certainly a setback, but it’s far from the end of the road. NVCA will continue to be the leading voice in Washington for immigrant entrepreneurship. 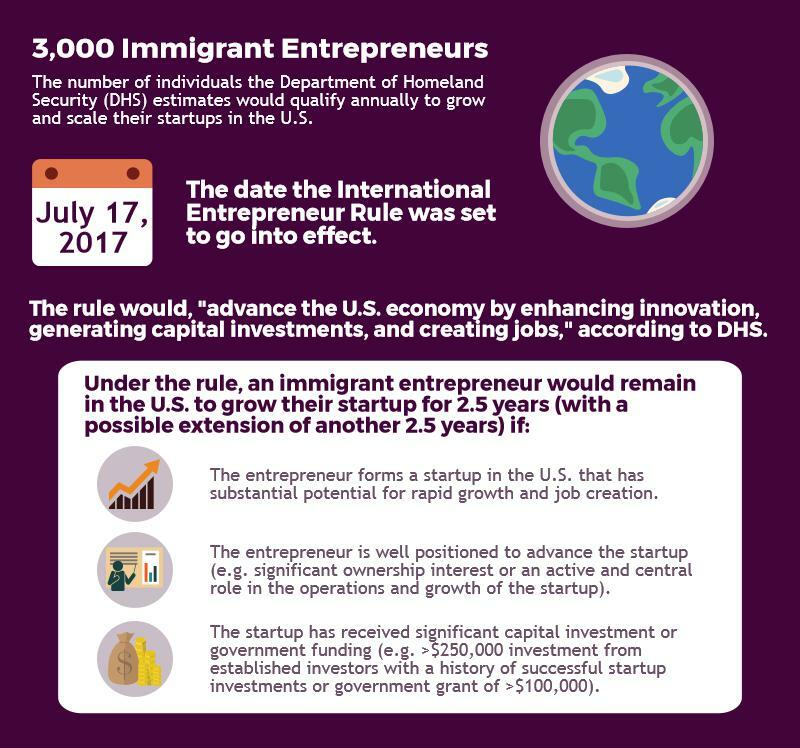 We’ll continue to advocate that the Trump Administration reverse course and allow the International Entrepreneur Rule to take effect. Only then will the United States realize the full benefit of immigrant entrepreneurs to our nation.